Dimensions 3.75 by 8 by 11 in. 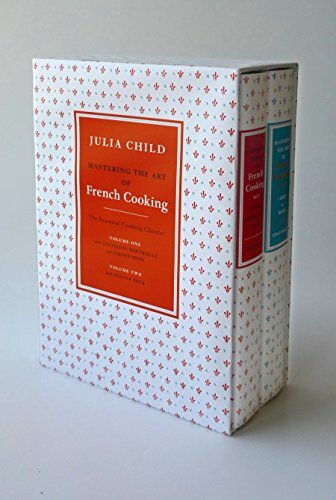 Amazon.com description: Product Description: The perfect gift for any follower of Julia Childâand any lover of French food. This boxed set brings together Mastering the Art of French Cooking, first published in 1961, and its sequel, Mastering the Art of French Cooking, Volume Two, published in 1970. Volume One is the classic cookbook, in its entiretyâ524 recipes. âAnyone can cook in the French manner anywhere,â wrote Mesdames Beck, Bertholle, and Child, âwith the right instruction.â And here is the book that, for nearly fifty years, has been teaching Americans how. Volume Two is the sequel to the great cooking classicâwith 257 additional recipes. Following the publication of the celebrated Volume One, Julia Child and Simone Beck continued to search out and sample new recipes among the classic dishes and regional specialties of Franceâcooking, conferring, tasting, revising, perfecting. Out of their discoveries they made, for Volume Two, a brilliant selection of precisely those recipes that not only add to the repertory but, above all, bring the reader to a new level of mastery of the art of French cooking. Perhaps the most remarkable achievement of this volume is that it will make Americans actually more expert than their French contemporaries in two supreme areas of cookery: baking and charcuterie. In France one can turn to the local bakery for fresh and expertly baked bread, or to neighborhood charcuterie for pÃ¢tÃ©s and terrines and sausages. Here, most of us have no choice but to create them for ourselves.